I'm an only child, and I wasn't a big breakfast eater, so my mother didn't always buy the popular cereals simply because I didn't eat them fast enough. But, oh how I wanted the prizes in the box, and I especially liked Frosted Flakes and Rice Krispies. Actually, when I did get cereal at home, I think I can recall her dumping it in a bowl so I could get the prize, and I'm willing to be I might not have been as interested in the cereal after that. I may be wrong, though. I always enjoyed spending the night at my friends' houses and waking up on Saturday morning to cartoons, and a wide variety of cereal to choose from, and I learned about such delicacies as Corn Pops and Sugar Smacks. I have 3 kids of my own, so we go through a lot of cereal, and Frosted Flakes and Corn Pops are big here, and I'm trying to pass along my love of Rice Krispies, but it has been translated into Cocoa Krispies for my kids. Do you have any cereals that you enjoyed as a kid? Do you still eat them? Do your kids like the same ones? To enter, leave a comment below and tell us about your favorite breakfast cereal. Contest ends 5pm PST August 30, 2010. Be sure to check out the BlogHer.com Kellogg exclusive offers page for 24 other chances to win a $100 Visa Gift Card and be sure to come back here each week, I'm doing a giveaway for the next 8 weeks. 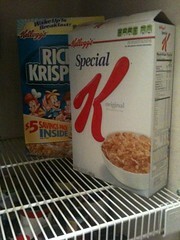 I love Special K....seriously love all the different kinds! My all time favorite cereal is Quaker Life cereal. We love Special K's fruit and Yogurt cereal. I liked Apple Jacks and Froot Loops as a kid now I like cereals from Nature's Path. My favorite is Cracklin' Oat Bran. Honey Bunches of Oats are great! Frosted Flakes are my all time faves! Rice Krispies - loved the 'snap, crackle, pop' as a child. AND love to make the treats for snack/dessert. Our favorites would have to be Frosted Mini Wheats with Raisin Bran Crunch a very close second!! My favorites are Rice Krispies and Frosted Flakes! We used to eat Frosted Flakes with Tony the Tiger when I was young so that is what I think of when I think of Kelloggs! My favorite childhood cereal was Cinnamon Toast Crunch! My sister and I would always beg my mom to buy it at the grocery store and every once in a while she would give in. Now I realize why she did not want us eating it every morning – it is practically sugar in a box, but so DELICIOUS! Nowadays, I love Cracklin' Oat Bran, Rice Krispies, Crispix and Frosted Mini Wheats. I am getting hungry just thinking about them! KELLOG'S corn flakes was the only cereal I would eat as a kid. My husband likes to mix 3 or 4 types together so we have a box of cheerios and rice crispies and more on our pantry shelf. I loved fruit loops as a kid now I like special K with berries. Apple Jacks or Apple Cheerios! I used to love Honey Bunches of Oats, but now I can't eat grains. Great giveaway! I love frosted mini wheats. God for kids good for adults. The best of both worlds. We like Rice Krispies and Special K.
Oh... Special K cereals (all flavors) are just plain awesome. I can't eat enough of 'em. For as long as I can remember, Frosted Mini Wheats are one of my favorites. I think I've passed on my great sense of taste to my family. As a kid I loved Cocoa Krispies! Haven't had them in years. I can’t help it….I love the kids cereals still! For my favorite, it’s a toss up between Fruit Loops and Honey Combs. Thanks for the great giveaway. My favorite is definitely Frosted Flakes!! I love Corn Pops and Apple Jacks. I also love how Apple Jacks is now made with more fiber. I could always use more of that! i like Kellogg's® Special K® cereal. it's nutritional and tasty. Love the Honey Smacks by Kellogg's! I love cereal! My favorite cereal right now is Corn Chex. With cold milk, it's soooo good. Special K- red berries or vanilla almond. Yum-o! Our favorite cereal is Kellogg's FiberPlus Cinnamon Oat Crunch. It's so yummy! My all time Kellogg's favorite is Frosted Flakes...yum-o! My own & my family's very favorite Kellogg's cereal is... Crispix. I liked Raisin Bran as a child and as an adult. I loved Froot Loops on the rare occasion I could have them as a child, and now I like them as a dessert as an adult. My favorite is a toss up between Raisin Bran and Frosted Flakes, but I really love a lot of other varieties too! My girls love Apple Jacks and Froot Loops! Thanks so much for hosting this giveaway! I love Kellogg's Frosted Mini Wheats Cinnamon Streusel. Raisin Bran is another favorite. My favorite cereal is Kellogg's® All-Bran® Complete® Wheat Flakes (although I still refer to them as 40% Bran Flakes); however, I don't ever have cereal for breakfast (well I have been known to eat Rice Krispie Treats or Peanut Butter Cereal [Corn Flakes or Special K] Bars in the morning, but never a bowl of cereal in milk early in the day). I'm an only child, too - so apple Jacks were a special "treat". Now I love Special K with red berries! We like Special K and Cinnabon! Thanks! We all love Frosted Flakes here. I l-o-v-e a bowl of Frosted Mini Wheats in the morning. Rice Krispy Treats are pretty awesome, too! I’ve loved Frosted Flakes since I was a kid, and they’re still my favorite. My favorite is Apple Jacks. But everyone here has a different favorite so we always have 3-4 different ones including Froot Loops and Frosted Flakes. Frosted Flakes as a kid. Now Corn Flakes. Kellogg's Honey Smacks are my favorite; the kids love Apple Jacks and my husband says Kellogg's Raisin Bran is the best. Frosted Mini Wheats! I loved them when I was little...and we all love them now! My favorite is Special K Blueberry and instant Oatmeal. Thanks for the contest. Frosted Flakes is my favorite cereal. my favorite cereal is Lucky Charms.Thanks for the chance to win!!! I’m a Kellogg’s Raisin Bran or Special K girl, but my husband and daughter are huge fans of Frosted Mini Wheats. I love Rice Krispies. I loved them when I was a kid and still do today! And nothing beats homemade Rice Krispy bars! Yum! My favorite cereal is Rice Krispies. We all like Kellogg's Raisin Bran. All Bran with yogurt bites! My favorite cereal is Frosted Mini Wheats! We were raised on Raisin Bran and Corn Flakes - our kids love them too! Only cereals I remember having in our house when we were children were Kelloggs Corn Flakes and Raisin Bran. Still love those corn flakes and love to make raisin bran muffins. Also like mini-wheats. Growing up I loved Honey Smacks!! My kids love Fruit loops and Corn Pops! They get the Corn Pops before school and the Fruit Loops in the summer time! I’m eating healthier now, so I love Kellogg’s Special K with strawberries or Kellogg's Cornflakes and I slice bananas and put in it! Yum! Apple Jacks and Frosted Flakes have always been my favorite! I love Special K with red berries!!! the regular Kellogg’s corn flakes with rooster on it.